Continuing a tradition began by Sa Bom Nim Lisa Donnelly years ago you are invited to post your SPIRIT messages for the 2012 Ko Dan Ja Candidates via the CyberDojang as indicated in the comments on this page. 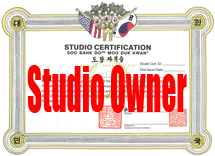 There may be other avenues for communicating your messages of support to those at the Ko Dan Ja Shim Sa, but directing them to the CyberDojang will ensure their delivery to the candidates on site while messages posted elsewhere may not get delivered to the candidates. Sam Dan 19785 Juliano John Mr.
Sam Dan 40578 Toomey, William Mr.
Sam Dan 41897 Alyssa Beck Ms. Note that because of spammers, only subscribers to the Soo Bahk Do Institute can post comments on this page.